Fehlman Waite was the son of Fred Waite and Nellie Fehlman. Vance Waite was the son of Fred Waite and Nellie Fehlman. Luther Waite was the son of Cyrus Henry Waite and Catherine L. Noble. Luther Waite died before 1940. Married Name Her married name was (?) Seeley. (?) Waite was the daughter of Cyrus Henry Waite and Catherine L. Noble. (?) Waite married Clayton Seeley. (?) Waite died after 1943. Clayton Seeley married (?) Waite, daughter of Cyrus Henry Waite and Catherine L. Noble. Clayton Seeley died after 1943. Married Name 5 September 1906 As of 5 September 1906,her married name was Lockhart. Florence Eberly married Robert Lee Lockhart, son of Andrew Lockhart and Nancy Randall, on 5 September 1906. Orville Lockhart was the son of Robert Lee Lockhart and Florence Eberly. Leland Lockhart was the son of Robert Lee Lockhart and Florence Eberly. Allen Andrew Lockhart was born on 11 March 1893 at Fulton, Illinois. He was the son of Elisha Lockhart and Effie Allen. Allen Andrew Lockhart died on 26 December 1938 at Los Angeles, California, at age 45. [S244] U.S. Federal Census 1910 U.S. Federal Census, by Ancestry.com, Year: 1910; Census Place: Garden Plain, Whiteside, Illinois; Roll: T624_331; Page: 1A; Enumeration District: 0128; FHL microfilm: 1374344. Name Variation Effie Allen was also known as Clara Effie. Married Name 24 February 1892 As of 24 February 1892,her married name was Lockhart. Effie Allen was born on 17 September 1866 at Fulton, Illinois. 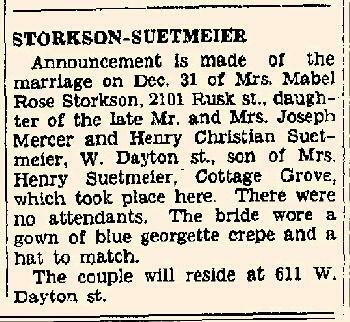 She married Elisha Lockhart, son of Andrew Lockhart and Nancy Randall, on 24 February 1892 at Whiteside, Illinois. Effie Allen died on 19 July 1926 at Clinton, Iowa, at age 59. She was buried after 19 July 1926 at Fulton Township Cemetery, Fulton, Whiteside, Illinois. Married Name 16 June 1886 As of 16 June 1886,her married name was Lockheart. Married Name 16 June 1886 As of 16 June 1886,her married name was Lockhart. Naomi E. Hutchins married Elisha Lockhart, son of Andrew Lockhart and Nancy Randall, on 16 June 1886 at Whiteside, Illinois. Name Variation Alfred E. Abbott was also known as Freddy. Alfred E. Abbott was born on 27 October 1914 at Wisconsin also reported as 1915. He was the son of Bayard Taylor Abbott and Priscilla Dionis Lockhart. Alfred E. Abbott died on 9 August 1976 at Brownsville, Cameron, Texas, at age 61 Alfred E. (Freddy) Abbott, 61, of 58 Rentfro, died today at his residence. A native of Fairfax County, Wis., he had been a Brownsville resident for 50 years. He was a member of the First Presbyterian Church. He had long been an active scout leader of Troop No. 3. Publication: Brownsville Herald August 9, 1976. Dorothy Abbott married Fred Louis James. Dorothy Abbott was born on 19 February 1916 at Wisconsin. She was the daughter of Bayard Taylor Abbott and Priscilla Dionis Lockhart. Dorothy Abbott died on 8 February 1989 at age 72. Donald Lockhart Abbott was born on 19 November 1917 at Wisconsin. Donald Lockhart Abbott died on 22 September 2005 at age 87. Fred Louis James married Dorothy Abbott, daughter of Bayard Taylor Abbott and Priscilla Dionis Lockhart. Fred Louis James was born on 21 June 1915 at Arizona. He died on 28 November 1992 at age 77. 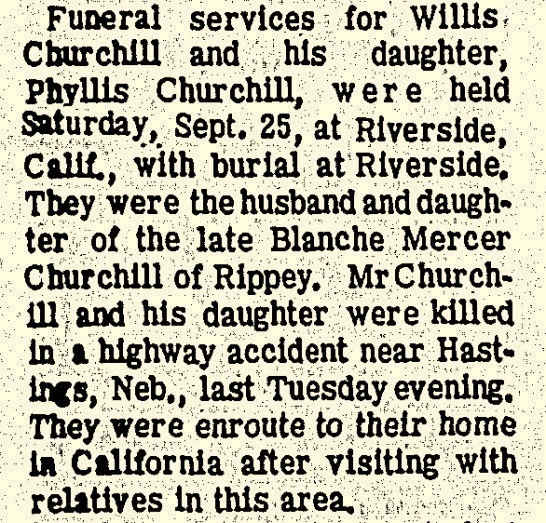 Phyllis Churchill was the daughter of Willis Edward Churchill and Blanche Veletta Mercer. 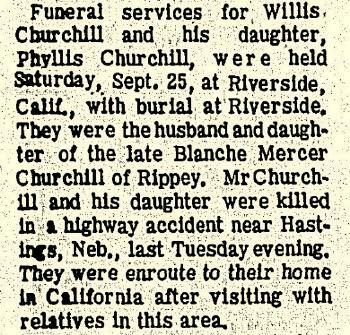 Phyllis Churchill died on 20 September 1965 Willis Churchill and daughter Phyllis obituary. 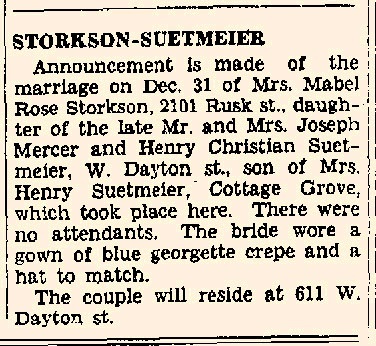 Henry Christian Suetmeier married Mabel Rose Mercer, daughter of Joseph Benjamin Mercer and Emily Delores Gallop, on 31 December 1935 Mabel Rose (Mercer) Storkson and Henry Christian Suetmeier marriage announcement. (?) Hickok married Ruth L. Mercer, daughter of Joseph Benjamin Mercer and Emily Delores Gallop, before 1936. John Springbrunn was the son of unknown (?). John Springbrunn died before 1944. Unknown (?) died after 1944. She witnessed the marriage of Evan L. Wheeler and Lorna Mae Lueders on 9 April 1944 at Reedsburg, Sauk, Wisconsin; Lorna Lueders and Evan Wheeler marriage announcement. John Pfoersching was the son of (?) Pfoersching. John Pfoersching was born at Alsace, France. John Pfoersching and Frederick Pfoersching immigrated on 2 October 1749 to from Liverpool, England to, Baltimore, Maryland. Mary Anise McGuire married Reverand Justus Holmes Pershing, son of Isaac Pershing and Frances Truxal. Mary Anise McGuire was born on 9 June 1848. She died on 23 October 1920 at age 72. Lizzie Jeanette Pershing was born on 9 December 1870. She was the daughter of Reverand Justus Holmes Pershing and Mary Anise McGuire. Avra Nelson Pershing was born on 23 October 1872. He was the son of Reverand Justus Holmes Pershing and Mary Anise McGuire. Mary Frances Pershing was born on 9 December 1875. Iris Robert Pershing was born on 5 September 1879. John Harry Pershing was born on 9 December 1882. Kathleen Pershing was born on 23 May 1886. Married Name 14 May 1833 As of 14 May 1833,her married name was Pershing. Elizabeth Davis was born in 1812 at Westmoreland, Pennsylvania. She married Joseph Mercer Pershing, son of Reverand Daniel Pershing and Maria Christena Milliron, on 14 May 1833. Elizabeth Davis died in 1839.